You know the song. Now see the show it's based on. Like how I rhymed there? 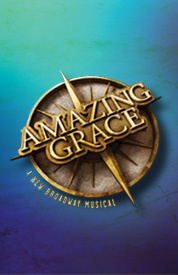 Amazing Grace, which is based on the 1779 song of the same name, is set to begin previews at the Nederlander Theatre on June 25, with opening night scheduled for July 16. What's that? A new Broadway show opening in the middle of the Summer? Unheard of right? Now while it's not out of the ordinary, most shows tend to open in the Fall, or in the Spring closer to Tony season. Makes sense to me. After all, the later a show opens, the fresher it is in the minds of the voters. But enough about next years Tony Awards. You came here to get information on Amazing Grace. So let's get to it. According to AllMusic, an online music service website, there have been over 7,000 recordings of the song since September 2011. Some of the most famous renditions include Aretha Franklin, Willie Nelson, Johnny Cash, Elvis Presley, and Mahalia Jackson. O.K. so now that you know who sang it, let's find out what the show is about shall we? Here is a brief synopsis about Amazing Grace to tell you more. Enjoy! Amazing Grace is based on the awe-inspiring true story behind the world’s most beloved song. A captivating tale of romance, rebellion and redemption, this radiant production follows one man whose incredible journey ignited a historic wave of change.John Newton , a willful and musically talented young Englishman, faces a future as uncertain as the turning tide. Coming of age as Britain sits atop an international empire of slavery, he finds himself torn between following in the footsteps of his father — a slave trader — and embracing the more compassionate views of his childhood sweetheart. But when a perilous voyage on the high seas finds John in his darkest hour, a transformative moment of self-reckoning inspires a blazing anthem of hope that will finally guide him home. Now to be honest when this show was first announced I wasn't quite sure what to think. However after reading that, and seeing some of the clips from the Chicago production, I am intrigued. I think I might just have to check it out. How about you? Want tickets to see Amazing Grace? Well you have come to the right place my friends. We sell it. In fact we sell tickets to every show on the Great White Way. Not only that but if you call now, we can get you tickets to see Amazing Grace at some incredible savings. Be advised that while this "Insider Price" is good thru September 6, it is for select seats, and always subject to availability. Get your tickets to see Amazing Grace on Broadway at the Nederlander Theatre. Who knows? Maybe I'll see you there. Until next time theatre fans.